London, June 18 (IANS) The hope that battery-operated cars can save the earth’s climate by reducing carbon emission is just a ‘fantasy’. According to experts, the technology used for electric car batteries is so backward that they will die within two years. The so-called energy efficient cars will be extremely expensive and cover far less distance on one battery charge than the manufacturers claim, they said. The research carried out by the Institution of Engineering and Technology suggests that claims about the performance of electric vehicles are ‘pure fantasy’. The researchers found the batteries are likely to burn out within two years, requiring expensive replacements. The batteries, which use the same lithium-ion technology as mobile phones, are unlikely to be able to run for more than 100 miles (160 km) between charges, the Daily Mail reported. Experts said the gap in performance between conventional cars and electric vehicles is so huge that consumers will not want to convert their vehicles to electric ones. Citing the examples of Ford Focus or Volkswagen Golf which is capable of travelling more than 360 miles (576 km)on one tank of fuel, the researchers said, for an electric car to offer a similar level of performance, the batteries alone would weigh 1.5 tonnes. They would be larger than an entire conventional car and cost approximately 100,000 pounds sterling, they warned. Chennai: Soon, either Chennai or Ennore port may go for carbon footprinting as a pilot project. It is planned to determine Green House Gas (GHG) emission sources, track emission trends and generate information needed to take steps for reduction. The Mercantile Marine Department of the Ministry of Shipping and Energi Services, a carbon footprint consulting company, organised a seminar on Saturday to impart understanding on the concept of carbon footprint of ports and ships, international regulations and work out reduction strategies. “The idea is to prepare the country’s shipping industry to adapt itself to the regulations of International Maritime Organisation (IMO) in future,” said R. Kannan, Chief Consultant, Energi Services. The shipping industry could gain from the Maritime Emissions Trading Scheme, a system for CO2 emissions trading in international shipping, and International Compensation Fund for GHG emissions from ships, he says. The International Association of Ports and Harbours has formed a consortium called World Port Climate Initiative as the CO2 emissions of world fleet of merchant vessels could climb to 6 per cent in 2020 from 2.7 per cent in 2009 if actions are not taken. “A carbon footprint of the port will reveal the amount of GHG emissions directly and indirectly released over a measured period providing valuable information on emission reduction strategies. There is a need to evolve strategies on GHG emission reduction on a localised basis,” Mr. Kannan said. At the seminar, delegates representing all types of businesses related to shipping and logistics were informed of the increasing demand for carbon footprint or products and services and methods to identify carbon hotspots and where to focus carbon reduction strategies. NEW DELHI: Municipal Corporation of Delhi (MCD) has earned carbon credits worth Rs 5 lakh against net carbon emission reduction (CER) achieved by making Okhla compost plan functional. This makes MCD the first civic agency in the country that has earned carbon credits. An MCD official said, ‘‘The CERs achieved from the Okhla composting plant — as part of the clean development mechanism (CDM) project — would be the first for any municipal solid waste management project in the country and also the first for any municipal solid waste composting project in the world. According to civic agency, 5127 CERs have been reported by IL&FS in its monitoring report and as per the concession agreement with MCD, 25% of the net CER earning (for the first 5 years) has to be shared with MCD. This annual process of monitoring and verification would continue for every year of plant operation wherein the annual performance would be monitored and credits would be issued in accordance with the performance of the plant in that year. ‘‘We hope to earn more carbon credits in years to come,’’ said the official. Udhagamandalam: The need to tackle the problems created by the dumping of discarded items and second-hand goods within the town has been emphasised by the Public Awareness Association of Udhagamandalam. Pointing out that they were a source of pollution, the Secretary of the Association, G. Janardhanan has in a representation made to the Pollution Control Board sought the removal of such items from areas like Bombay Castle. A suitable place should be found for them outside the town. The ban on air horns should be implemented stringently. The practice of using kerosene as fuel for vehicles particularly mini buses should be curbed and restrictions should be imposed on playing music at high volume in public places. Conservancy staff should not be allowed to set ablaze waste materials. An end should also be put to the practice of setting fire to the dry grass inside the race course. Smoke emission testing facilities should be set up near check posts. India’s eve of the Copenhagen climate conference announcement of voluntary measures to reduce the country’s carbon intensity have been welcomed by WWF-India. Prime Minister Dr Manmoham Singh said the intention was to reduce India’s carbon intensity by 20-25 percent of 2005 levels by 2020. ‘We welcome the declaration made by the Honourable Minister for Environment and Forest, Mr Jairam Ramesh and hope that this will be a strong step in moving towards a low-carbon sustainable model of development since the targets will be met through the use of better and more efficient technology,’ said Mr. Ravi Singh, CEO of WWF-India. In effect, India’s current declaration at the backdrop of the projected economic growth will ensure that the country moves towards a sustainable path to low-carbon economic development, and at the same time move towards attaining the Millennium Development Goals. A 20-25 percent reduction in the carbon intensity of 2005 levels, by 2020, will ensure that India stays low in terms of it’s emission intensity while its economy continues to grow. ‘We strongly support this declaration which included an outline of a low carbon path for our Indian economy and in knowledge of the fact that it will make for a better future for the country, we request all Indians and leaders from all sectors of society, business and economy to see that these targets are actually exceeded’ Singh said. The announcement also provides areas where India can take leadership – legislating a mandatory fuel efficiency standards for vehicles in the transportation sector, mandatory building codes implemented across states, amending the Energy Conservation Act 2001 to bring in mechanisms for energy savings certificates, and maintaining forests as carbon sinks. With the move showing India’s ambition to help advance the talks for a fair and ambitious global climate treaty, WWF has urges the Indian government to come up with more voluntary actions related to greening of the economy in the coming years. ‘India can emerge as a true leader among its peers,’ Singh said. BANGALORE: As big global players play the game of negotiations, and as the opposition wakes up to the implications of India’s green plan as announced on Thursday, the Indian Space Research Organisation has come up with an alarming figure – the Gangotri glacier has receded by 1.5km in the past 30 years. 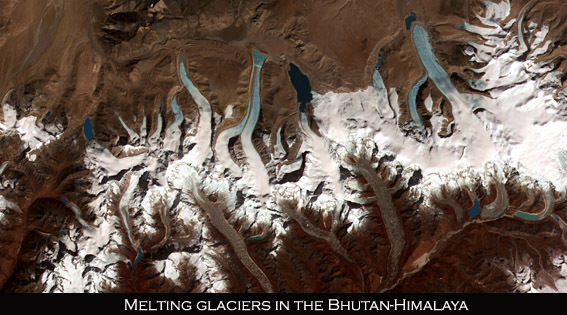 The fact that the glacier has been receding isn’t new. In fact, in the last decade, it has receded by 15-20 metres (although the pace has slowed down in recent years), Isro’s latest figure dramatically brings out the extent of glacial melt, caused possibly by global warming. Isro’s director of Space Applications Centre, Ahmedabad, Dr R R Navalgund told TOI that satellite imagery documents a 1.5-km retreat of the Gangotri glacier in the past 30 years. The satellite imagery has also captured that Alpine vegetation has now started growing at a higher altitude than it used to a few decades ago. While the retreat of glaciers was a very controversial issue recently, after environment minister Jairam Ramesh released his discussion paper on glaciers that also alleged that glaciers were not melting because of climate change. Navalgund echoed the sentiments of MoEF on the issue. “We have looked at snowy glaciers, some of them in the past 20 years, specially the ones at lower latitudes and altitudes, have retreated. It is difficult to say whether it is due to global climate change. It could be a part of the inter-glacial period and other related phenomena,” he said. The documentation of coral reefs have also shown bleaching across the coastline. UNEP had also recently declared that coral reefs, which support the majority of marine life, will be the first casualty of climate change. Isro data reiterates that the reefs around the Indian sub-continent are facing maximum impact – not so much in the Andaman and Nicobar Islands, but in other parts. Navalgund said there was no quantitative analysis yet on the impact on agriculture. “Agricultural simulations are too less to make any quantitative analysis,” he said. Asked about the upcoming Copenhagen negotiations, Navalgund said he has given all the data that Isro has gathered from its satellite images to the environment minister a month ago. “To understand the impact of climate change for India, baseline data is very important. India did not have a scientific, accurate database of baseline data. Now we need to put those down so that later, we have a valid document to fall back on,” he said. Very soon, other countries can also access data on carbon sink from Isro. The Oceansat, that continuously monitors the ocean colour, helps in analyzing productivity in the oceans. This is useful in measuring the carbon sink in the oceans. Many countries have given their letter of intent to use this satellite. NEW DELHI (Reuters) – India thinks it may be possible to cut its carbon intensity by 24 percent by 2020 compared with 2005 levels, according to provisional government estimates obtained by Reuters Wednesday. Carbon intensity is the amount of carbon dioxide emitted for each unit of gross domestic product. By 2030, India estimates it could achieve a reduction in its carbon intensity by 37 percent from 2005 levels. The figures were arrived at after an analysis by various government departments. A senior government official who declined to be named said India’s final targets, likely to be presented at next week’s global climate change talks in Copenhagen, could reflect a broad range rather than a specific figure. India’s carbon intensity cut figures are based on a projection that the country would achieve 20 percent energy efficiency by 2020 from 2007 levels. India, the world’s fourth highest emitter, is under pressure to announce details of how it will control its growing carbon emissions, and issuing targets will likely strengthen New Delhi’s hands at the Copenhagen negotiations. China and the United States, the top and second largest emitters in the world, have unveiled plans to curb greenhouse gas emissions, leaving India the only major polluter still to issue any targets. Government sources said India’s Environment Minister Jairam Ramesh will make a statement in parliament Thursday in which he could announce the targets. The carbon intensity projections are likely to be voluntary domestic action and not open to verification by foreign inspectors or part of any legally binding agreement. Also, it was not immediately clear if India would pledge its carbon intensity or energy efficiency targets as part of any global deal. The carbon intensity goal still means that India’s overall emissions will rise in coming years, just not as fast as its rapid economic growth needed to lift millions of its inhabitants out of poverty. According to an analysis by WWF India based on the 2020 and 2030 carbon intensity figures obtained by Reuters, India could slow down growth in carbon emissions by 12-14 percent by 2020 from 2007 levels. “Looking at India’s renewable energy targets and plans in forestry sector up to 2020, this is possible,” Shirish Sinha, the head of WWF India’s climate change and energy program, told Reuters. Developing countries, under no obligation to make any cuts under the existing Kyoto protocol, say they could make the shift to less polluting economies with a helping hand from the rich. Many larger developing countries, such as China and India, say they are taking voluntary steps to curb the growth of their emissions, such as increased use of renewable energy and imposing energy efficiency standards. The December 7-18 U.N. talks in the Danish capital were aimed at settling a legally binding deal after arguments between rich and poor nations about who should cut emissions, by how much and who should pay. Negotiations have run out of time but there are still hopes that a substantive political pact can be agreed at the meeting instead. India has said rich countries such as the United States were offering “anemic” cuts. But they still could help seal a global deal by transferring emissions-reducing technology and paying to reduce the impact of climate change on vulnerable communities.